Garage Pros can repair, service, install the garage doors, in Calgary, and other metropolitan areas. Whether you want to service your current garage door repair or looking to install a new one, we can help. A sudden breakdown of garage door is the result of door mechanism wearing off or any damage caused to the door hardware. No matter what the cause is, a poorly functioning garage door can severely impact your garage door security and your schedule. If the garage door is giving you trouble, get in touch with us. Garage Pros technicians are reliable, fast and efficient enough to provide you same day garage door repair services. In most areas we also offer emergency garage door repairs. Being the largest provider of garage door installation and repair services, we work with the best. When it comes to the garage door repair, Garage Pros has the best team of professionals providing dedicated and unbeatable services to ensure that the garage door project moves on smoothly from the start to the end. When taking the garage door repair services, you can ask our professionals to implement customization features. Our technicians can adjust the garage door springs and tracks to ensure that the door functions seamlessly. 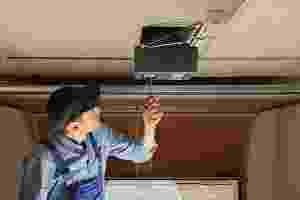 If you have problem with the garage door opener, we may replace or repair that too even. You may check out the line of garage door openers we have. We guarantee you 100% satisfaction on all the garage door repairs carried out in the same day. Our professionals come with the truck loaded with repair parts to carry out the repair. Our representatives will happily answer to your calls and resolve your queries. You may take the price quote over the phone. So, just do not allow the malfunctioning garage door to keep you from doing necessary works or the things you need to do. Give a call to us today and allow one of the Gulliver Garage Doors technicians to assist you. Contact us today to schedule a repair or to ask any questions. So, get in touch with us now to learn more about our services. We are there to assist you for all 24 hours.